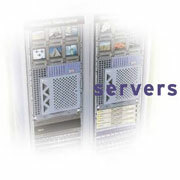 GVS’ Metropolis 7000 highest-end enterprise class server supports 250 plus network clients and comes standard with server clustering and Hot/Swap redundancy features. Gigabit/Fiber MCR routing (IP over fiber) technologies deliver data throughput of up to 3.2Gbit/sec over the network virtually eliminating production bottlenecks. The Metropolis 7000 is designed for applications such as IP multi-casting, video serving/routing, streaming, and can accommodate up to 32 concurrent rendering engines. Advanced file and storage management utilities ensure data integrity and availability. It can be equipped with up to 50TB’s of on-line NomadicVI Fiber RAID storage as well as a Nomadic series 56TB Altrium Archival solution for secure data archival. The Metropolis Advantage: GVS’ mid to high-end servers offer unique advantages to workgroups by accelerating their workflow, vastly increasing their productivity, greatly reducing their down-time, and enabling easier collaboration, GVS’ Metropolis solutions have all the benefits/availability of the SAN and NAS topologies while introducing and integrating new technologies which allow lower cost, more flexible upgrades and client additions (no need to spend more to add new workstations), and intuitive, secure system administration and management. Best of all, the Metropolis solution can integrate with your legacy systems; so you can continue to utilize your current investments.